This vintage trolley was built in 1929. It originally ran on the streets of Porto, Portugal. It is now part of the San Francisco Municipal Rail or MUNI. Today the car was part of the F-line that runs from 17th and Castro down Market to Fisherman's Wharf. "No Main Street in America has had rail service longer than San Francisco's Market Street," boasts a MUNI pamphlet I picked up on the car. 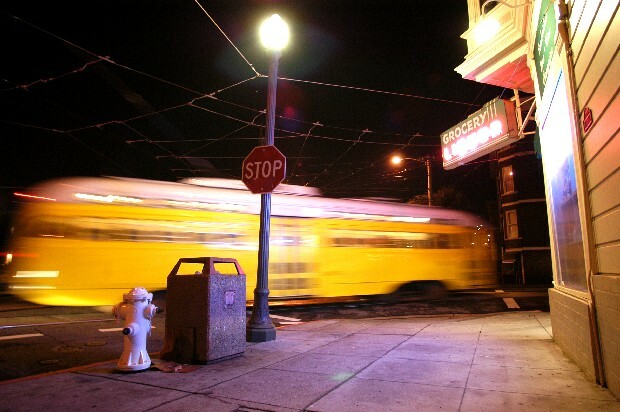 I picked up this picture at 17th and Noe using a Sears tripod borrowed from my brother. Tonight we all ate homemade raviolis. There was no white flour in the house the night before when the raviolis were started so half of them were made with whole-wheat flour. Everyone said the whole-wheat variety wasn't bad at all. I took their word for it.